The one dollar gold coin was first proposed by Treasury Secretary Alexander Hamilton, but was not included in the provisions of the Mint Act of 1792. Taking note of the successful Bechtler family mint in the gold mining region of North Carolina, the U.S. gold dollar was again considered by Congress in 1836, as part of a major overhaul of the nation’s coining laws. However, Mint Director Robert M. Patterson appeared before Congress in December of that year, and convinced lawmakers to remove the gold dollar coin from further discussion, over concerns about its smallish size and ease of counterfeiting. The one dollar gold coin was brought up in 1844, but once again, Patterson squashed the idea, citing his previous objections. The Director also pointed out the increased cost to the Mint and the unpopularity of small gold coins in other countries where they had been introduced. The discovery of California gold in 1848 shifted the dynamics of the gold dollar debate. With a new massive gold reserve on hand, the question was no longer if there should be a one dollar gold coin, but in what form it ought to take. Some favored the coin with a hole in the middle, to increase the diameter of the coin while retaining the same weight. Mint Engraver James B. Longacre created some pattern coins utilizing this concept, even before final legislative action. On March 3, 1849, the one dollar gold coin was authorized by Congress. The law specified a solid coin of only 13 mm in diameter, sending Longacre back to the drawing board with the task of designing the smallest US coin ever minted for general circulation. The 1849 law also brought about the Double Eagle $20 coin. Longacre’s design consisted of a left-facing portrait of Miss Liberty wearing a coronet (a small crown) in her hair. She is surrounded by 13 stars, representing the 13 original colonies. With little space to work with, the reverse was necessarily kept simple, bearing the words “1 DOLLAR” and the date within a plain wreath, encircled by the words ‘UNITED STATES OF AMERICA”. 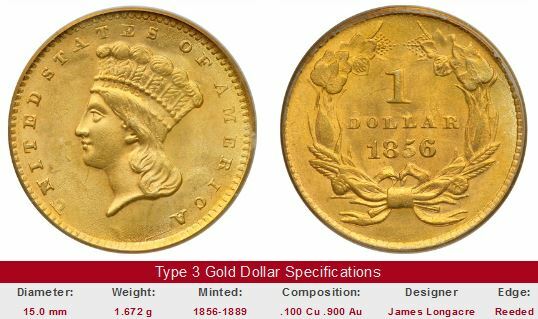 Beginning in 1849, one dollar gold coins of this style were minted at Philadelphia, Charlotte, Dahlonega, and New Orleans. The San Francisco Mint started operations in 1854, and likewise issued the gold dollar coin. Numismatists have named the 1849-1854 dates the Type 1, or Liberty Head Dollars. They are also called Coronet Gold Dollars. Pictured directly above is the Type 1 dollar. 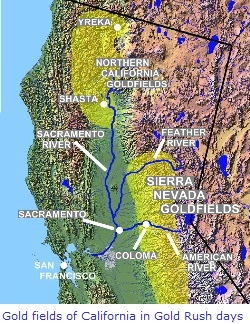 The map above shows the goldfields of California. San Francisco was a small settlement before the rush began, but when news of the gold discovery reached the town, ships, businesses, and homes were quickly deserted in favor of joining the Gold Rush. As thousands of seafaring fortune seekers and merchants from all over the world began arriving, San Francisco exploded in population, rising from an estimated 1000 people in 1848 to perhaps 25000 by 1850. The sudden surge of people stretched the infrastructure of San Francisco and other towns near the goldfields. The "49ers" lived in tents, wood shanties, or deck cabins removed from abandoned ships. Very few of them got rich, but some of the first gold-seekers were able to find large amounts of the most easily accessible gold—in some cases, thousands of dollars worth each day. As predicted by critics, the tiny size of the coin caused problems; they were easily misplaced (a big loss for someone who earned one dollar a day! ), plus nearly everyone had to squint to read the inscriptions. 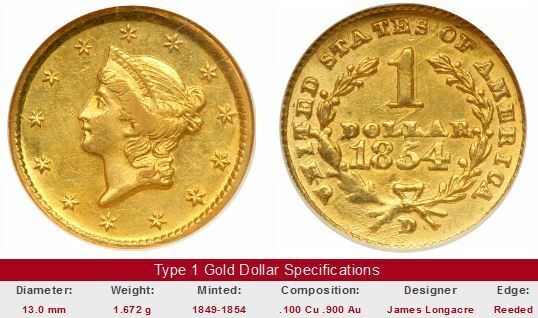 As a result, the gold dollar was modified in 1854, its diameter increased to 15 mm and made thinner. Liberty donned a feathered headdress, appearing as an Indian princess. Her head was reduced in size, compared to the previous design. The reverse shows the date and denomination within a wreath of corn, cotton, wheat and tobacco. These are called the Type 2, or Indian Gold Dollars. Problems with the Type 2 gold dollar were quickly observed. The head of Liberty was raised too far above the surface of the coin, meaning that there was insufficient metal flow into her head during the striking process, because metal was trying to fill into the reverse design elements at the same time. The outcome was that many Type 2 gold dollars are weakly struck. Very few specimens display crisp details in the hair, with lettering on the reverse barely discernible. 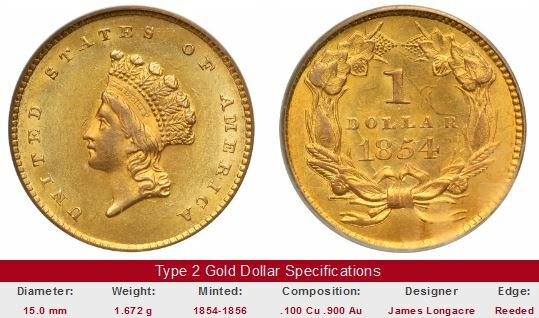 Adding to the shortcomings of the Type 2 gold dollars was the fact that they wore down quickly in circulation. To correct this flaw, Longacre yet again put forth a new design in 1856. The portrait of Liberty was made larger and flatter, and she wore a different type of headdress. Also, lettering around the edge of the obverse was repositioned closer to the rim to compete less with metal flow requirements of the reverse. The Type 3 Indian Gold Dollar finally did the trick. Size, quality, and durability goals were met with the Type 3 dollar. The coin remained in production every year until 1889. Despite their manufacturing difficulties and diminutive size, the US gold dollar immediately became an important coin in everyday commerce. From 1849 until the Civil War, fairly large quantities were minted and remained in circulation, even more so than the silver dollars of the time. The reason for this was that value of gold relative to silver had declined due to the large influx of the yellow metal unearthed in California, hence making silver a more valuable commodity ratio-wise and driving it into the arms of bullion dealers. As the Civil War unfolded, most of the nation’s coinage disappeared from circulation. Uncertainty over the outcome of that cataclysmic conflict led individuals to hold onto their hard currency as a measure of financial security. Far removed from the battlefields, coinage in the western states continued to circulate freely, including the gold dollar. The opening of massive new silver mines in Nevada and Colorado flooded the metals market, causing the value of gold to rise relative to silver. Now the bi-metallic relationship was reversed, and it was gold coinage that was removed from public view. Minting of the gold dollar diminished sharply thereafter. When the Bland-Allison Act required large scale production of silver dollars beginning in 1878, the gold dollar series toiled in virtual anonymity until Congress ordered its termination following the release of the 1889 issues. Of all the gold dollar coins, the rarest is the 1849-C with open wreath. An MS-63 specimen with proof-like qualities was sold in July 2004 for a staggering $690,000. The 1861-D is probably the most famous one dollar gold coin of all. No one knows how many were made, but the number is assuredly very small. The 1861-D dollars were struck by the Confederacy following the takeover of the Dahlonega Mint by southern forces in April 1861. It is believed that a small quantity of gold on hand at the time of the seizure was used to produce the coins. At least $10,000 is required to acquire this historically significant coin. eBay auctions has more gold dollars for sale than most dealers, so its a good place to start your search. The links below will pull up auctions of the date highlighted. Despite the enormous number of coins on eBay, you'll probably have to check quite a few times before you find any of these gold dollars. Yes, they are rare indeed. The coin pictured for sale in the right hand side, if any, is not necessarily the same condition coin as that represented in the value trend analysis on left hand side. It is very wise to consider only coins graded by the services of PCGS, NGC, ICG, or ANACS. American gold coins have been the target of counterfeiters for a long, long time. We stumbled onto an informative article describing how the pros detect counterfeit coins.